THEIR many names slide through recipes as slippery as the noodles themselves: Cellophane, glass, transparent, silver or bean thread noodles also go by soon hoon, bai fun, woon sen, sotanghon, dang myun and harusame -- nearly every country in Asia has its version. In Hawaii, we call them long rice. Whatever the packaging, these noodles are basically starch, the most common being mung bean starch, which is exceptionally strong and resilient and contains a little protein, too. But imports can list a half-dozen other pantry powders, not all accurately translated. Japanese brands are especially baffling, as they might include some combination of arrowroot, corn, potato, sweet potato, tapioca and/or yam. The different mixtures create nuances of texture, color and shine that also affect price. 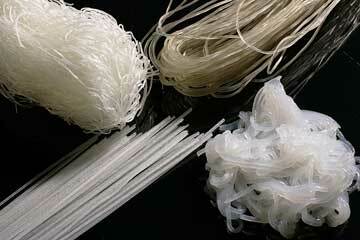 But since they are starch and water, cellophane noodles have no real flavor of their own. They soak up whatever sauce they sit in, lending a toothsome texture and prized bulk. Except for the cheapest brands (which store managers unanimously describe as coming from China), they are basically interchangeable and behave more or less the same. Potato, cassava, mung bean or yam, the plant parts have already been "cooked" into a gel and passed through a ricer to form the noodle shape (hence the term "long rice"), so cellophane noodles need only a brief plunge in boiling water -- if that -- after a 10- to 20-minute soak to soften, depending on the type. Why so many types? Custom, primarily. Japanese favor the delicacy of their harusame ("spring rain") noodles, which come cut in straight, even lengths, a scant handful to a package, and cost up to five times as much as the typical tangled skeins of mung bean. Korean dang myun, made of sweet potato starch, is the muscular opposite: Gray and long, folded into three large hanks per unwieldy package, you'd never guess it's the transparent noodle used in chap chae at take-out Korean barbecue stands. Its texture distinguishes it from other types: thick, chewy, super-absorbent and famously resilient. Try shooting one at a fellow diner. Filipinos use a cellophane noodle for the dish pancit sotanghon that might be confused with the thin noodle used in pancit bihon, once you discover that this latter "rice noodle" is actually made of cornstarch -- just like some other types of cellophane noodle. But the two are hardly interchangeable. In fact, the most important distinction to make is between cellophane noodles, which are starch, and rice noodles, which in nearly all cases are made exclusively of rice. Although they may appear translucent when dried -- especially the thin sticks labeled "rice vermicelli" -- rice noodles cook up white, soft and prone to disintegrate, especially after long cooking or soaking. By contrast, the typical mung bean noodle is nearly indestructible. Rice noodles are sold fresh in Chinatown and dried in groceries, often in Vietnamese packaging, in a range of sizes and types. 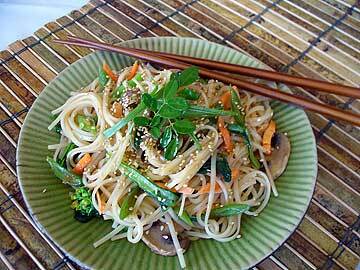 They can be substituted for cellophane noodles in a pinch, but the texture of the dish will not be the same.